Carter’s mishandling of American foreign policy, particularly during the Iran hostage crisis of 1979-80, was one of the keys to his political demise in the 1980 election. He resurfaced in Pyongyang in the mid-1990s, when he intervened in the midst of a crisis with North Korea and negotiated an agreement — the “Agreed Framework” — under which the regime, then ruled by Kim Il Sung, agreed to “freeze” its nuclear program in exchange for new nuclear reactors that would not produce weapons-grade material, and oil supplies. Carter was not, however, prosecuted under the Logan Act, which prohibits private citizens from conducting diplomacy on behalf of the United States, and which was used to spy on former Trump administration National Security Adviser Michael Flynn. Later, Carter’s interventions were blamed for helping to launch a Palestinian terror war against Israel. 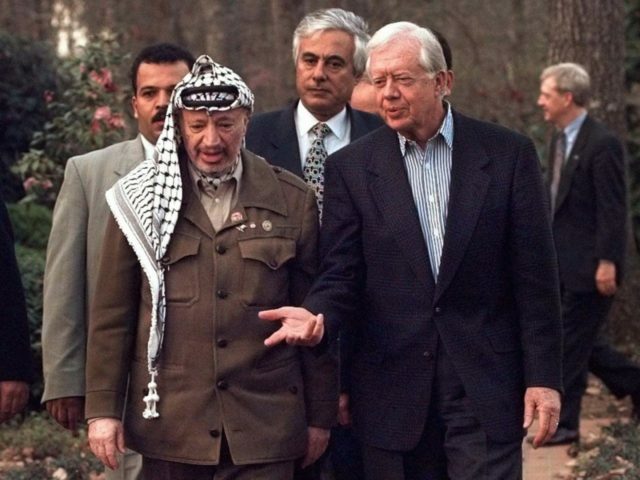 As Alan Dershowitz argues in The Case Against Israel’s Enemies: Exposing Jimmy Carter and Others Who Stand in the Way of Peace, during peace talks at Camp David in 2000, Carter may have advised then-Palestinian leader Yasser Arafat “to reject Israeli offers and walk away from the table.” (41) Arafat launched the second intifada soon thereafter. Carter told USA Today that he was worried that Trump was appointing people who supported his administration’s policies. “I am concerned as a matter of fact about his deliberate moves to get into the key positions of government just people who agree with him,” he said.